Yup, you read that headline correctly. Platinum Games, the maker of such fine titles as Mad World, Bayonetta, Metal Gear Rising, The Wonderful 101, and more, is creating a game based on The Legend of Korra series. It's being published by Activision as a download-only title for PC, Xbox 360, Xbox One, PlayStation 3, and PlayStation 4. We all saw the reveal teaser yesterday, but now it's time I told you how the game plays. Platinum is aiming to ship this one out in the fall of this year, and based on what I got to play of the alpha build, the game is shaping up to be a pretty solid action brawler. For all you fans of the series, The Legend of Korra game takes place right after book two, centering on the consequences of what happened at the end of last season. Think of this as more of a self-contained episode, a nice side story before we deal with the real consequences in Book 3: Change which debuts this Friday on Nickelodeon. Show creators Michael DiMartino and Bryan Konietzko worked closely with Platinum to develop the game. They even jointly created the new villain, one that uses a new type of Chi blocking that has left Korra powerless at the beginning of this adventure. 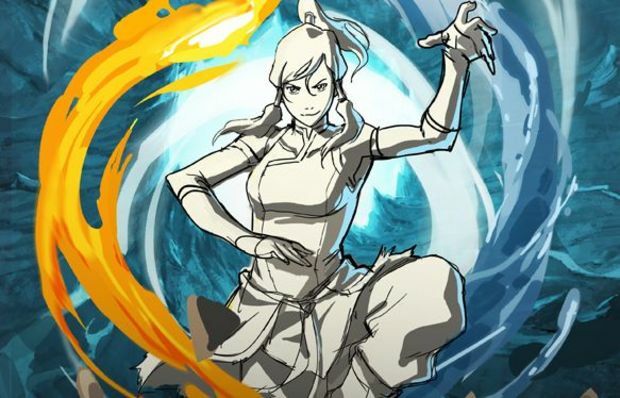 Her powers haven't been taken away completely, and as you go through the levels (with set pieces taken from the show such as Air Temple Island, Republic City, more), Korra will remember how to use her bending abilities once again. The story here will reference elements from the show and there will undoubtedly be a lot of callbacks that will make fans happy. That said, don't let that keep you from this game. The action elements are pretty awesome, thanks in large part to Platinum's skills at making great combat mechanics. All you need to know is that you're playing as a real badass who can bend the four elements of fire, water, air, and earth to her will. As Korra re-discovers her various bending skills, she'll find that she's stuck using more of the basic attacks with each element. But as you progress and level up, you'll upgrade your attacks and learn new combos. What makes the fighting top notch here is how seamlessly you can swap between your four powers as you're unleashing combos on enemies. 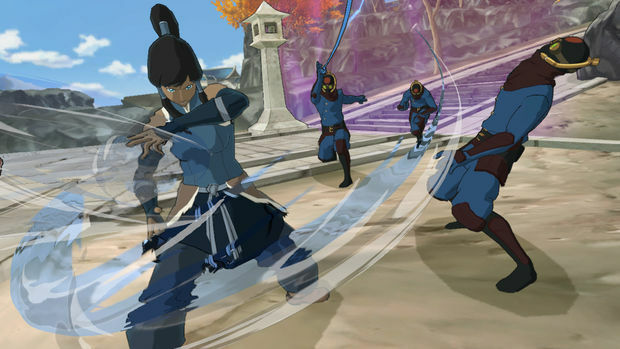 Water bending, for example, is good for long-range attacks -- either throwing out projectiles, or using a "water whip"-like move to reel enemies closer to you. On the other hand, air bending is best as an area-of-effect attack when dealing with a group of enemies surrounding you. Each bending style offers something unique, and it's best to mix up your attacks as much as possible. Oh, and you totally can summon an air ball and ride it around just like in the show. Between your light and heavy attacks, you also have a special charge attack for more powerful bending moves, plus there's a dodge and counter move as well. Countering is especially encouraged, most of all when dealing with boss-type enemies. It's a similar counter system to that of Revengeance, where you have to learn the enemy patterns to best time the counter over being babied and getting some notification to time the counter correctly. 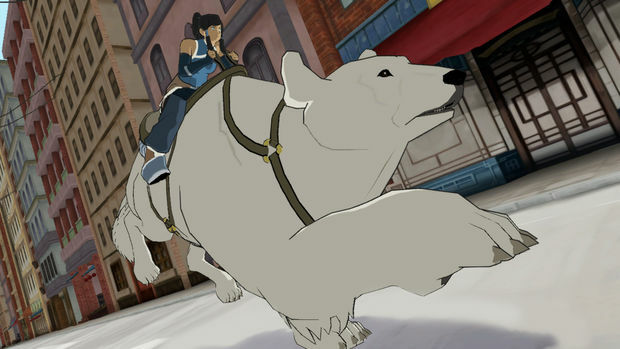 Though, admittedly, the learning curve for timing is way smaller in The Legend of Korra. And yes, you can go into the Avatar state. The specifics of what will allow you to summon your special ability haven't been quite nailed down yet, but ultimately the game will let you know when you can go full out, and at that point you'll be unleashing all your bending abilities at once for a duration of time. Again, for an alpha, the combat system was pretty damn fluid. The camera was a little finicky during my hands-on time, but didn't ultimately hinder my session. I was impressed with how far along the game was already, and there's going to be loads of time for polish between now and the release date. Visually, the game was looking nice too. 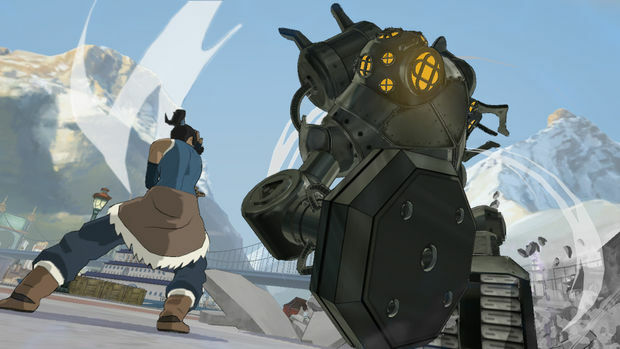 The cartoon-y/cel-shaded look was pleasant, especially when the different bending elements were in use by the player or enemies. Speaking of which, while the big boss is new, most of the enemy foot soldiers were recycled from the past two seasons of the show. My playthrough saw me encountering chi blockers, Mecha Tanks, and some of the Triads too. A nice touch though at least is that chi blockers can knock out whatever last ability you were using for a small duration of time. The voice actors from the show reprise their role here for the game, and a large chunk of the game's music is taken from the show too. On top of the core action elements, there's also a Naga-running section where you have to navigate levels much in the same way as something like in Temple Run. 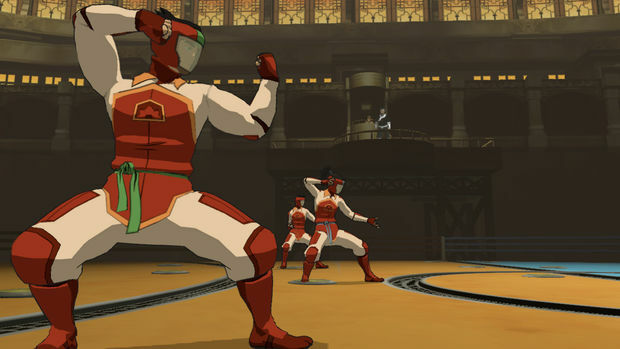 Plus there's Pro-Bending sections where Korra, Mako, and Bolin will be fighting others in Pro-Bending! So, you're probably asking at this point how this crazy collaboration came to be. Platinum, a Japanese studio, working on a license game of a American TV series that takes heavy influences from Japanese anime. And it's being published by Activision, no less. Well, on Activision's end, the specific office in charge was presented with a list of developers to work with. It was a "no brainer" when they saw that Platinum was an option, as Robert Conkey, producer on the Activision side told Destructoid. 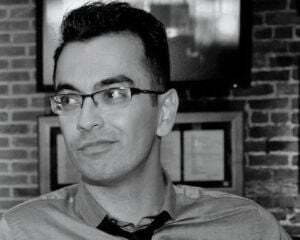 "These guys are one of the best third-person action developers in the world." "One of the first impressions with Korra was that [we] were blown away by how awesome the show was. The main reason [we] were interested in the brand was one, [we] were really impressed with how involved the story was and how detailed it was. It was just really fascinating to [us]. Just the fact that it's so detailed and the fact that each of the bending styles is based on actual different types of Kung-Fu. The way that it's actually animated is just really impressive. "There's more to it than that too. There's the love story that they have, and there's Bolin as the comic relief and the comedy in it is just awesome. [We] felt that it was an incredibly well put together and balanced show and [we] hadn't seen something like that before ... [We] felt like [we] could relate. In a lot of [our] older games, it was often that they had a serious side to it but it also had a tongue-in-cheek aspect. We considered it a challenge that we never really had to do it very strictly before, stick to a brand and actually realize that brand while still keeping to [our] way of making games." I think the one only downside to The Legend of Korra game is that it's going to be four hours long for an average playthrough. Of course you can do replays and go for 100% completion, but as a giant fan of the cartoon series, I wish there was going to be more. Otherwise, like I said before, think of this as a self-contained episode. It's not going to outstay its welcome, and it's a solid deal when you also factor in that this will be $14.99 when it comes out. Oh, and there's a 3DS The Legend of Korra game in the works. I only found out because it was offhandedly mentioned in the press release I got so I guess Activision doesn't have much faith in it? Anyway the 3DS game is being developed by Webfoot Technologies as a retail release where it follows the same story as the console version, but it's a turn-based strategy RPG where you maneuver Korra and her allies around on the battlefield.